Garrett Conover in his element – we can’t wait! 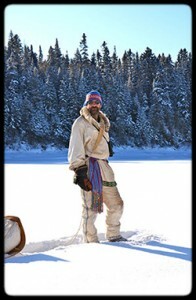 We are pleased as punch to be welcoming the Legendary Maine Guide, co-author of “Snow Walker’s Companion“, and one of our personal role models, Garrett Conover on trip with us this year! For over three decades Garrett and Alexandra Conover ran North Woods Ways, offering traditional guided canoe and snowshoe trips in Maine, Quebec and Labrador. Their writing, expeditions and way of life have been an inspiration to Kielyn and I. I can say without any sense of exaggeration, that we would not be doing what we are doing today if we had not come across the teachings of Garrett and Alexandra. Garrett will be joining us on our Explorer’s Club Expedition this year: Missinaibi Headwaters (10d). This should prove to be a very special treat for ourselves and all of this year’s Explorers!